A large number of people from all age groups participated in the 8th Dehradun Race organised by the UNESCO Club, Dehradun, to spread the message “Donate Blood Save Life”. 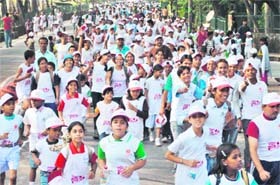 About 3,000 people took part in the race. From small children to elderly persons participated in the race. Some parents ran with their children on their shoulders. The race started from the Pavilion Ground here at about 9:30 am and culminated at the same point after passing through Kanak Chowk, Subhash Road, Bahal Chowk, Clock Tower, Paltan Bazar, Raja Road, Gandhi Park and Darshan Lal. Participants of Team Uttarakhand were in town for a test drive in a modified gypsy for the 12th edition of the Himalayan Car Rally organised by the Himalayan Motorsport Association that will commence in Himachal Pradesh from October 10 and conclude on October 15. Vijay Aggarwal, member of Team Uttarakhand, test-drives his vehicle for Himalayan Rally in Mussoorie on Sunday. While almost all big tourism projects which were started by the Centre and state governments to boost tourism and biodiversity in environmentally fragile areas have more or less failed, the efforts of Dhan Singh Rana and Sunil Kainthola have met with success. 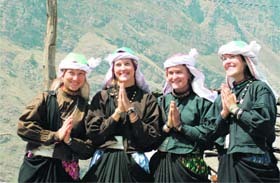 Foreign tourists don local costume at a camp by Mountain Shepherd in Chamoli district. The death and destruction caused by incessant rain, cloudbursts and floods in the hill state of Uttarakhand this monsoon was unprecedented. More than 200 persons lost their lives in various rain-related incidents during the period as public as well as private property worth thousands of crores was destroyed. In the absence of a regulatory body, paramedical institutes are having a free run, much to the chagrin of students who are subjected to unjustified fee hikes and poor quality of education. The problem has been aggravated by government’s reticence in moving forward the Uttarakhand Para Medical Council Bill-2007, already drafted by the government. The Bharat Vikas Parishad, an NGO, will be organising a national group song competition at Roorkee on October 24. This was disclosed by Savita Kapoor, regional president of the NGO, at a regional working committee meeting held here today. DAV PG College entered the final of both girls and boys of the District Handball Championship underway on the Parade Ground here. In girls final, DAV PG College will face SGRR, Nehru Gram, and in boys final the college set up final clash with Stadium. For their outstanding performance, players, coaches and district associations of badminton were honoured by the Uttaranchal State Badminton Association at a hotel here today. A three-member committee will be made to fix draws during the state badminton championships from now on. The decision was taken by the Uttaranchal State Badminton Association after it received complaints from some players and their parents of favouritism in the fixing of the draws during the state badminton championship that concluded here yesterday. Sports is an integral part for all-round development of students and this has come true with the 46th Aquatic Swimming Meet where students of IIT from across the country came together to participate in the event. The meet was organised by the IIT, Roorkee. To welcome a new batch of students, the Dolphin (PG) Institute of Bio-Medical and Natural Sciences, Dehradun, celebrated its freshers’ party here today. The great extravaganza was conducted by senior students of II and III year for the new batch. Students enjoy at a freshers’ party at the Dolphin Institute in Dehradun on Sunday. Selaqui International School celebrated its 10th founder’s day on the school premises here today. As a part of the occasion, students participated in a sapling-gifting drive that was organised by the school at Dalanwala. A large number of people from all age groups participated in the 8th Dehradun Race organised by the UNESCO Club, Dehradun, to spread the message “Donate Blood Save Life”. About 3,000 people took part in the race. From small children to elderly persons participated in the race. Some parents ran with their children on their shoulders. The race started from the Pavilion Ground here at about 9:30 am and culminated at the same point after passing through Kanak Chowk, Subhash Road, Bahal Chowk, Clock Tower, Paltan Bazar, Raja Road, Gandhi Park and Darshan Lal. 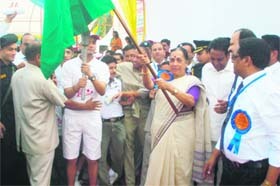 The race was inaugurated by state Governor Margaret Alva. The Governor appreciated the effort of UNESCO Club and encouraged people to donate blood and save lives. The participants were served with refreshments and fruits. They were also presented kits, T-shirts and caps. Participation certificates were also awarded to them after the event. Speaking to mediapersons here today, rallyist from Uttarakhand Vijay Aggarwal said there was no financial support available from the state for the riders and the government was also not concerned about the prestigious international event so far. 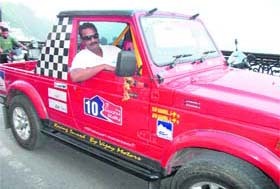 Aggarwal, a motor spare parts owner and rally enthusiast, said his team was participating in the rally for the past 20 years at their own cost and had not received any financial assistance from the government so far. The veteran of the Mughal Rally and runner-up twice in various rallies, said they were still waiting for recognition from the government for their accomplishment. He said this year Vikrant Bhandari, under the name of Team Uttarakhand, was participating in the rally. He said he also wanted to participate in the rally, but due to financial constraints, as each rally cost more than Rs 4 lakh, had opted out this year. 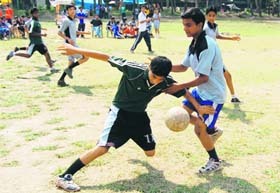 Aggarwal said the Uttarakhand team was participating with the theme of “Go Green” promoting environment conservation. He said the state government should promote this sport as it would not only inculcate a sense of adventure among the youth, but also add revenue in the form of high-end tourists. He also met Chief Minister Ramesh Pokhriyal Nishank, who refused to support them citing the recent disasters as main reason. The rally will pass through Nalagarh, Solan, Manali, Kaza, Keylong and Sarchu and terminate at Manali on October 15. The distance of the rally has been shortened this year due to the recent Leh disaster and damaged roads. The distance of the rally will be 1,668 km as compared to last year’s about 2,500 km. The Raid-de-Himalaya is the only Asian motor-sport event listed on the off-road rallies calendar of the Switzerland-based Federation Internationale Motorcyclisme (FIM) and has put the hill state of Himachal Pradesh on the international motor-sport map. More than 175 enthusiasts will be participating in the event and Team Uttarakhand will participate in X-treme category, which is considered the most dangerous in the rally. Bhandari will be competing with six foreign participants, all from Austria. Premiere driver Suresh Rana of the Thunderbolt team, Sunny Sidhu, champion of the Mughul Rally, and a team of the Indian Army will show their skill in the adventure sport. 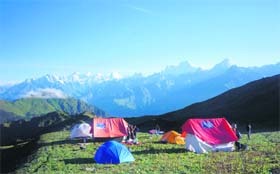 A tourist camp by Mountain Shepherd in Chamoli. The projects involved opening of hotels and resorts and invoking community participation by providing them employment in these accommodations or other tourists activities. Dhan Singh Rana and Sunil Kainthola, residents of Dehradun, had established their company Mountain Shepherd Initiative Private Limited in 1994. These environment lovers, who had participated in the Chipko Andolan, jumped into another one in 1998, after the Nanda National Park was established, when communities were barred from using the area for their livelihood. Later, the government relaxed the rules, but the experience certainly opened new vistas for this duo to explore tourism for the benefit of the community and, most importantly, to make them equal stakeholders. “The boys employed with us are stakeholders with equal equities,” said Kainthola. Sunil, who stunned the audience with the success story of his maiden experiment, said, “We have proved that there is no need to build posh accommodation, like hotels or resorts, for adventure tourism in hill states. Mere clean and comfortable camps or tents equipped with clean water and simple food and good equipment for adventure activities such as rafting, mountaineering and paragliding are needed. The ones, who look for luxuries should stay away from the mountains. They should rather go to plains and stay in five-star hotels”. He said true nature lovers were the ones who switched off their mobile phones while seeking solace and pleasure from nature. These technocrats have woven their success story by using technology to their advantage. They got help from an outsider who read about them on the Internet, contacted them and facilitated them with a website. The website has fascinated several foreign tourists and even those who facilitated the training for their boys at the Nehru Institute of Mountaineering (NIM). Not only this, they have also placed their tour packages, short video films, GPS reading etc on the youtube website. The twosome has employed 70 dropout youngsters and got them trained. “We selected school dropouts living in and around scenic places throughout Garhwal as the highly educated would rather look for big and steady jobs. “The selected youngsters were then provided professional training and the ones meant for mountaineering purposes were sent to NIM, Uttarkashi”. Now, the group is doing so well that they will open their institute to provide basic knowhow in adventure sports. Their team handles sightseeing and adventure sports. Other services like arranging railway or air tickets and conveyance from Delhi airport to destinations in Uttarakhand are outsourced. Keeping in mind the bright future of the green tourism industry, Sunil has been reinvesting his income to buy land to pitch their own camps. They have managed two in Uttarkashi and one at Dhodi Taal so far. Their next step is to again rope in technology for further diversification. “Internet users will be able to buy good literature on Uttarakhand, music, films and handicrafts put forth by us though online payment gateway services where customers will get the product within 48 hours,” Sunil said. The duo has definitely set an example for others entrepreneurs to follow and make their own destiny without looking to governments for assistance. Life in the entire state came to a standstill during the month of September as a majority of the roads, including highways, got damaged. Precious agricultural land was washed away along with crops. Small farmers, poor people living in kutcha houses in the hills as well as in the plains were the worst hit. Prime Minister Manmohan Singh, after a visit by Congress President Sonia Gandhi, was prompt in giving an interim relief of Rs 500 crore and dispatched a Central assessment team to the state. The relief amount has led to politics in the state. Interestingly, the state government first asked for a relief package of Rs 5,000 crore and then suddenly joined chorus with the ruling Bharatiya Janata Party (BJP) Rajya Sabha MP Tarun Vijay who demanded Rs 21,000 crore as relief from the Central government. This has led to an intense political debate among leaders of the ruling BJP and the Opposition Congress. While state government officials briefed the Central assessment team to demand the whopping Rs 21,000 crore, the Congress leaders have started doubting the intention of the state BJP government. The track record of the bureaucrats who will be ultimately responsible for the spending of any relief amount has been suspect since the formation of the state. But, the Congress suspects motives in the demand made by the BJP state government. They term it as a clever move by the BJP in the election year. It was a fact that people of the entire state reeling under the natural calamities was annoyed with the politicians of all hues, particularly those of the ruling party, for doing practically nothing to alleviate their miseries. The BJP’s demand of Rs 21,000 crore as relief has put the ball in the court of the Congress-led United Progressive Alliance (UPA) government at the Centre. Knowing fully well that it will not be possible to get such a huge amount from the Central government, the state BJP leaders have a strategy to deflect the blame for its own failures at the doorstep of the Central government for not giving an adequate relief. This has started worrying the Congress leaders. Leader of Opposition Harak Singh Rawat has been candid in saying that the damage has been to the tune of Rs 2,000 crore and the state BJP government was just playing politics on the issue. He charged that the state government wanted to siphon off the relief amount. 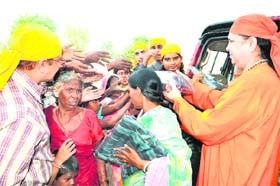 There have been demands by Congress leaders about the monitoring of the relief amount that comes from the Centre. Union Minister of State for Labour and Employment Harish Rawat suggested that all-party teams in various district should be formed to prioritise the rebuilding of the damaged infrastructure. After the gloomy September as the sun started shining brightly, there was a hue and cry to save various trekking teams stranded at various places in higher hills. A 28-member Brazilian trekking team and a nine-member team from West Bengal were rescued. The state government was prompt in claiming credit for the rescue of these stranded trekkers. However, the reality was in stark contrast to the claims. The 28 Brazilians hired a private chopper on their own and the nine West Bengal trekkers came on their own to Uttarkashi. However, the state government was pressurised by the West Bengal government to lend a helping hand in tracing another group of trekkers from the state who were lost on the Kalani trek route in bad weather conditions. After several sorties by the helicopters hired by the state government there was no trace of the trekkers on the route. There was another disappointment for the cricketers and cricket lovers of Uttarakhand. Even after 10 years since the separate state of Uttarakhand came into being in November 2000, various cricket associations from the state failed to get affiliation for Uttarakhand from the Board of Control for Cricket in India (BCCI). At a recent meeting of the affiliation committee of the BCCI, the claims of the warring cricket associations was again rejected. Initially, there were four cricket associations from the state vying with each other to claim affiliation, but over the years two other associations have joined the group. It has been disgusting for the budding cricketers that the associations have failed to put a united effort to get affiliation for the state. However, amidst the disappointment for the cricketers, there was a silver lining as the state was included in the catchment area for the Delhi Dare Devils team of the Indian Premier League (IPL). This will give talented cricketers from Uttarakhand an opportunity to get selected in the Delhi team. In Dehradun, there are as many as 13 paramedical colleges, attracting students from far and wide. “Despite the fact that several colleges have opened in the neighbouring states of Haryana and Himachal Pradesh, it is the climate and peaceful environment of the city that is attract a large number of students but we are also paying through our nose. 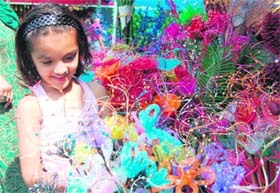 We do not mind paying, but there the quality of education is still poor,” said Sudhir Singh, a parent. However, owing to a lack of an Act, some of these institutions are functioning from campuses as small as three or four-room buildings. Some institutions have not been able to build campuses due to land shortage and cumbersome procedures associated with their establishment. As of now, the Uttarakhand government inspects the institutes and no-objection certificate is given by Garhwal University. In the absence of a council, even the appointment of physiotherapists has not been undertaken against the required posts. Against a demand of 42 physiotherapists in the state government hospitals and PHCs/CHCs, only four are on the roll, two each at Doon Hospital and Haldwani Hospital. Actually paramedics are not accorded the status equivalent to a doctor and usually viewed as assistants to main doctors. But, this has much to do with the lacuna existing at the level of planners, who did not accord priority to paramedical education. While informing about the programmes, she said all 20 branches spread over the region would be participating in the competition and the one who won it would be entitled to participate at the national-level competition. Savita further said they would also be organising a national Sanskrit group song competition in Rishikesh on November 11 and a contest named “Bharat Ko Jano” would be held in Haridwar on November 27. Savita said they would also be organising a national camp for disabled on December 12. Besides, women’s meeting was also scheduled for December. She added that the national convention of the parishad would take place in Agra on and December 25 and 26. Acharya Prabudh Narayan Kaushik, general secretary of the parishad, discussed the five-point activities of the organisation there. In today’s boys’ league matches, KV, IIT, beat Devi Club 12-10. KV, ITBP, faced defeat at the hands of KV, Hathibarkala No. 1, 25-14. Sanjay Khampa (eight points) and Sachin (seven points) scored in the win of Hathibarkala. The Stadium team thrashed the Doon Club 16-6 with the fine contribution of Vikram (six points) and Gopal (five points). DAV PG College also beat KV, Hathibarkala No. 1, 23-17. Dilbar and Gangan scored eight points each for DAV. DAV PG College in another boys league match beat SGRR, Nehru Gram, 18-15 with Gagan scoring with highest eight points for the former team. While in girls league matches, SGRR beat KV, ITBP, 7-2. Neha (four) and Minakshi (three) were the main contributors in the win of SGRR. Also, DAV PG College defeated SBS College 9-2. Pooja and Aarti were the main scorers for the DAV girls’ team. For their outstanding performance, players, coaches and district associations of badminton were honoured by the Uttaranchal State Badminton Association at a hotel here today. The players, coaches and associations were given prizes by Ashok Kumar, president of the association. Kumar congratulated them for their excellent performance and encouraged them to keep on doing well. Players who were felicitated include India’s junior No. 1 Chirag Sen, national-level junior doubles Kuhoo, Bodhit Joshi, Lakshya Sen, Akshita, Smriti Nagarkoti, Vyom, Vaibhav, Prajwal, Arnav, Ujawal, Tuhsar, Puneet Bhatt, Udit Dobhal, Rohit Raturi, Ashish, Aman, Mohit, Dikshika, Sheetal, Lokesh, Deepak Bisht, Vikas, Poonum Tiwari, Vasupande, Bhaskar Agarwal, Rohit Ronit and Ayushi. 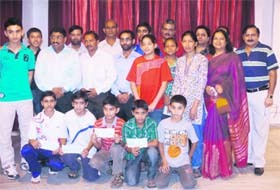 For the top-quality training, DK Sen, Nirmala Pant and Deepak Rawat were presented cheques of Rs 5,000 each. Besides, district associations of Dehradun, Haridwar, Almora, Nainital and Udham Singh Nagar were also honoured. These associations were awarded with cheques of Rs 3,100 each. Speaking on the occasion, Kumar appreciated the organising committee that held the All-India Junior Ranking Prize Money Tournament in Haridwar in February for making it a successful event. Kumar hoped that the forthcoming tournament to be held in February would also be a successful event like previous one. Meanwhile, a meeting was held to chalk out plans for holding the next tournament. An organising committee was also formed for the event. To complete the shortage of referees in the state, the association will conduct a test in January in Rudarpur. Those who pass the test will become state referees. President of the association Ashok Kumar said, “Yes, we have received some complaints like this and we have decided to form a three-member committee for fixing of the draws in the future events”. A parent of one of the state top players, who didn’t participate in the tournament, said, “The draws play an important role in any particular tournament. But in this tournament, discrimination was done in deciding the fixture that is why my son pull out of the competition”. “There should be no member, whose son/daughter is playing in the tournament, in the committee for fixing the draws,” said the tensed parent. There are certain informal events on the agenda to encourage sports, along with studies, amongst students. There are 20 events scheduled and so far 14 events have been conducted. Several events were conducted today, where the highlight of the day was record-breaker Pratik Gupta of the IIT, Kanpur, who broke his previous record in 100 metre free-style men by 1 minute 99 milliseconds. Second in 100 metres was Kuwar Walia of Ghuwati and third was Dhruv Mehta of IIT, Kanpur.There were a number of students to cheer their buddies. 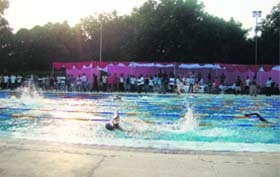 Nivedeta Sharma of the IIT, Roorkee, led 50-metre butterfly in women category, where second winner was Sanskriti Semwal, IIT, Mumbai, and Hutokshi Sethna of IIT, Mumbai, was third. Roorkee students have been making position in many of the events, where once again Nivedeta Sharma stood second in 100 metre free-style women, while she was led by Sanskriti Semwal of IIT, Mumbai, and Poorna Kumar of IIT, Madras, came third. In 100-metre breaststroke, men, IIT, Khadakpur, bagged the first two positions, while Chirag Sialoke was declared first followed by Shreyas, and third was Abhishek Vata of IIT, Roorkee. Tomorrow there will be water polo finals played between Khadakpur and Kanpur as Kanpur defeated Madras today in semifinals 4-3 and Khadakpur defeated Mumbai 6-5. Tomorrow is the the conclusion of the 46th aquatic meet followed by a closing ceremony of the event. The party began with lighting the ceremonial lamp by Chairman of the institute Arvind Gupta, Principal Dr Shailja Pant, Vice-Principal Dr Arun Kumar and Vipul Garg, Dean, Dolphin Student Welfare Society. Welcoming the new batch of students, Gupta urged them to abide by all rules and regulations of the institute so as to bring a good name to the college. He also said the institute was one of the finest colleges in India that worked only for the students’ interests and strictly opposed ragging. The students of II and III years presented a cultural event. 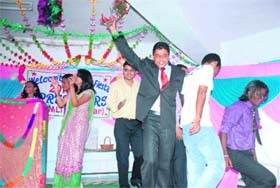 They also conducted contests for freshers to elect Mr and Miss Fresher for different departments. The celebration began with prayers held at the Aadharshila on the school premises. Additional Director-General of Police Ajay Kumar, who was the chief guest, lighted the lamp. This was followed by unveiling of a new sculpture, SELAKRITI, that was placed on the Aadharshila. The celebration moved ahead with a cake-cutting ceremony by Om Pathak, a former IAS officer and chairman of Gurukul. The presentation showcased a series of pictures depicting the making of the school from a piece of land to a beautiful full-fledged structure. Rohit Pathak, Headmaster of Selaqui International School, was also present on the occasion. Later in the evening, students and staff went to Dalanwala to gift saplings to Doonites to spread awareness regarding global warming and depleting forest cover in India and the world.